The timeline of Canadian history features an array of events that underlie the evolution of the country as it approached its contemporary form. These events not only defined the country, but influenced its unique identity within the North American political and social climate following the Second World War. Through its years of isolation during the Duplessis era in Quebec, the divisions of language became central to establishing a contrast between French and English-Canadians. As an influential symbol to the Quebecois in the middle of the twentieth century, the Montreal Canadiens were viewed by French-Canadians in Quebec as a symbol of national identity, especially with their star player, Maurice “The Rocket” Richard. In a defining moment in both the histories of the National Hockey League and that of Quebec, the Richard Riot of 1955 were a moment within a series of moments towards the eventual reclaiming of French-Canadian land during the Quiet Revolution. This will be explored through understanding the context of 1950s Quebec and the traditional regime of Maurice Duplessis; followed by a discussion of the moment on March 17, 1955 in Montreal; and finally, by evaluating this moment’s influence in the larger structure of the context in Quebec’s national movement towards modernization with the Lesage government elected in 1960 and the following Quiet Revolution. In the search of finding moments that matter within the larger context of Canadian history, historians apply the Moments Approach whereby the moment is chosen based on its local community impact, its structural influence, and its problematic historiography.1 The Richard Riot present an important moment in the process of Canadian nation-building parallel to converging national movements developing in the province of Quebec. The local community impact of the Richard Riot were both economically damaging and socially frowned upon but an influence towards larger structural change occurring in Quebec through the national divergence of French-Canadians from Canada. The problematic historiography of this moment is muddied through the different perspectives of French and English writers discussing the event. This blog post will use the Moments Approach to demonstrate the Richard Riot of 1955 as an event among a series of political and social changes, marking the beginnings of a national movement in Quebec as it approached its period of modernization and developing a unique identity. In the case of riots, these events are frequently stemmed from long term internal conflict. Each riot must have some pre-existing and widespread understanding and shared perception of a common identity. This was demonstrated through Quebecers in the Richard Riot of 1955. French-Canadians had for a long time developed anxieties of being dominated by the British presence during colonial and post-confederation Canada.2 Since the nineteenth century and the influx of a British presence in Quebec, British merchants had taken hold of the economy in the province thus establishing the anglophone dominance of the Quebec economy. This was Maurice Duplessis’ basis as to his isolation of the province of Quebec during the “Grand Noirceur” lasting his regime as premier. 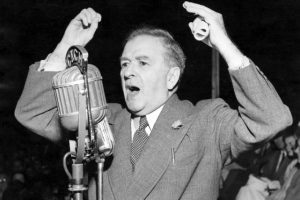 Duplessis was elected under the Union Nationale twice: first between 1936-39 and 1944-1959. Duplessis was known for his distrust of the federal government, having stated that the federal government was the child of the provinces and not the other way around.3 Following the Great Depression and the Second World War, Maurice Duplessis sought to economically remove the province from the control of the federal government in order to avoid any more manipulation from outside the province.4 This decision came from his refusal of sending French-Canadians overseas upon conscription and was reflective of developing nationalist initiatives in the province. Moreover, rather than provide significant economical progress to the province, Duplessis stunted economic development because of his conservative ideologies. Through his focus of developing rural regions and in refusing to create trading relationships outside of the province, Duplessis isolated the province and thus impeding modernization.5 The issue with Maurice Duplessis was his refusal to grow the province and his insistence on attacking federalist decisions and creating a further political divide between anglophones and francophones living in and outside of Quebec. Instances of Duplessis’ attacks on the federal government are the appointment of the Tremblay Commission of Inquiry on Constitutional Problems in 1953, which studied the division of tax revenue between the different levels of power in the country.6 Through this commission Duplessis argued for changes in the constitution that should be made and thus further developed tensions between the anglo-dominant federal government and the French-Canadian minority living within the borders of Quebec. The Richard Riot are, on the surface, based on the sport of hockey. The Boston Bruins and the Montreal Canadiens have an on-ice and off-ice rivalry that any long-time hockey fan would be able to discuss, as it is often considered to be the best rivalry in all of hockey history. In a late-season game, March 13, 1955, an on-ice confrontation happened between Bruins player Hal Laycoe and Maurice Richard of the Canadiens. While the Bruins player was about to have a penalty called against him, Richard had his “wires touch.”7 He slashed the Bruins player in the head and proceeded to attempt to hurt one of the on-ice officials. He ended up punching linesman Cliff Thompson in the face twice, knocking him unconscious. Richard was kicked out of the game and immediately fined $100.8 Boston police then attempted to arrest Richard before both the Bruins and Canadiens teams turned the police away, stating that the league was going to take care of the incident and not law enforcement. A hearing for the incident happened at the league commissioner’s office, Clarence Campbell, in Montreal, three days later. Present at the hearing were Richard, Laycoe, Thompson and management from both the Bruins and the Canadiens.9 This being Richard’s second major offense of the season, Campbell suspended Richard for the rest of the season and the playoffs. Montreal fans were immediately enraged, some even expressing their anger by calling the NHL’s head office, which at the time was in Montreal, and issuing death threats to the NHL’s commissioner. Feeling around the league, however, believed that the punishment was more than fair and could have even been worse, considering Richard’s past violent history with players and officials dating back to seven years prior. The riot then occurred. “Montrealers” rioted as their favorite and best player had just been suspended for the rest of the hockey season, ending their championship hopes immediately. Part of the reason they rioted was due to the French population of the city believing that the English elite of the NHL had taken advantage of their majority status by punishing the best French-Canadian player in the NHL.10 Campbell attended the next home game for Montreal where over 6000 non-ticket holders showed up in the lobby of the Montreal Forum (the home arena for the Montreal Canadiens at the time). The crowd was raucous but when police began to intervene, the crowd became violent, resorting to throwing bricks and ice chunks through windows and at passing street cars. After the first period of the game, Montreal trailed 4-1. 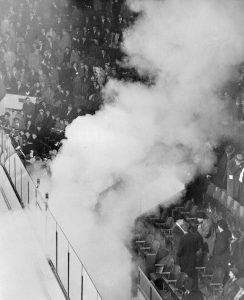 The fans responded by booing Campbell, throwing eggs and other debris at him and one fan even managed to attack Campbell landing a slap and a punch on the league’s commissioner.11 A riot had broken out in the arena and Montreal’s fire department ordered an evacuation of the building, effectively suspending the game. Montreal would end up conceding the game to punish its fans. As the fans left the arena the riot outside grew bigger, leading to injuries in the police force and over twenty civilians injured as well. The riot would only end at 3 AM, seeing multiple stores on St. Catherine Street being looted, amounting to over $100,000 in damages.12 Over 40 arrests were made and has gone down as one of the most dangerous nights in Montreal’s long history. The significance of the Richard Riot is its demonstration of a cultural division between French and English populations in the province of Quebec and therefore was an active factor in the development of the Quiet Revolution. 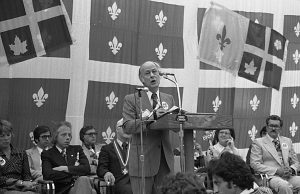 The Quiet Revolution was an era in Quebec history which began in 1960 with the election of Jean Lesage’s Liberal Party. This period is marked by Lesage’s saying: “maîtres chez nous,” instigating that Quebecers were to run their province, separated from the federal government.13 The riot, as suggested by Shoalts, was not so much a movement towards separation entirely, but more so the French minority of Canada reclaiming their power within their own boundaries.14 This establishing of boundaries of French-Canadians living in Quebec signified the establishing identity aligned with taking control over internal matters. These movements towards self-government within the province was essentially an economic reclaiming. This reclaim saw Lesage try to claim more provincial powers in order to effectively renew the economy in Quebec whereby it was run by the French majority.15 This assertion was the foundation of the Quiet Revolution which in time developed into a full-force nationalist movement towards separation brought by the growing presence of the Parti Québécois by the end of the 1960s. The Quiet Revolution’s theme of breaking away from central structures is also displayed by the provincial government’s divide with the Roman Catholic Church.16 The Church had consistently held a significant hold on social and political structures in Quebec and thus it represented a drastic renewal of the provincial government. The significance of the Richard Riot is in its drastic splitting of Canadian culture through which is brought about major nationalist moments in search of a sovereign Quebec. Although some scholars agree that the Quiet Revolution began in 1959 after the death of Premier Maurice Duplessis, to many French speaking Quebecers, the 1955 Richard Riot sowed the seeds of provincial sovereignty, secularization, and the creation of welfare states in the years that followed.17,18 However, to argue that the riot categorically led to the revolution would be an overstatement. What the riot did create was the perceived perspective of the French-Canadian experience during 1950s. A typical Quebec French Canadian saw an Anglophone president of an Anglophone league suspending a French player, unfairly, symbolically mirroring the power dynamics occurring in the province. Prior to the Quiet Revolution, French Canadians were inherently disadvantaged within Quebec. Politics were still being dominated by the traditional middle class, which was circumscribed by the Anglophone business sector.19 Presently, Quebec is a dramatically different province than the pre-1960 era. The efforts of the Quiet Revolution have shown results as Quebec’s political landscape is currently dominated by a new francophone business class.20 There is, however, one major factor that should be noted, as Quebec proceeds into 2018. The province will soon be holding the 42nd general election in the fall to elect members of the National Assembly of Quebec. According to the Montreal Gazette, for the first time in about 50 years, the old federalism-versus-sovereignty debate will not be main point of debate. All three parties, including the main rivals of the Liberals, have put that issue aside. The Coalition Avenir Québec has decided to run on a Federalist platform, while the second party in opposition, the Parti Québécois, says it will not hold a referendum if it gets a mandate.21 Federalism, however, contradicts the narrative that the Richard Riot and Quiet Revolution promoted. The Quiet Revolution is often conflated with Quebec sovereignty, and could be argued that it triggered the two ensuing referendum votes to separate from Canada. However, the main objective wasn’t concerning sovereignty but rather to reclaim provincial power allowing French Quebecers to be heard. During the Richard Riot, French Quebecers took to the streets of Montreal to assert themselves as they were tired of being dismissed from the provincial elite. 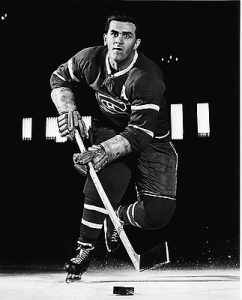 The suspension of Maurice Richard was not only an injustice to the player, but also an injustice to all French Quebecers alike. 1 “Welcome to HIST 203,” History 203, January 10, 2018, McGill University. 2 R. M. Burns, ed., English-Speaking Quebecer in a Separated Quebec vol. 6, 12 (Montreal, QC: McGill-Queen’s University Press, 1971): 122. 3 Gervais Stephan, ed., Quebec Questions vol. 4, 29 (Oxford University Press, 201): 49. 4 Herbert F. Quinn, “The Role of the Union Nationale Party in Quebec Politics, 1935-48,” The Canadian Journal of Economics and Political Science / Revue canadienne d’Économique et de Science politique 15, No, 4 (November, 1949): 524. 5 Herbert F. Quinn, “The Role of the Union Nationale Party in Quebec Politics, 1935-48,” The Canadian Journal of Economics and Political Science / Revue canadienne d’Économique et de Science politique, 526. 7 Jean Béliveau, Chris Goyens, and Allen Turowetz, Jean Beliveau: My Life in Hockey, (Toronto, Ontario: McClelland & Stewart, 1994): 89. 8 Jean Béliveau, et al., Jean Béliveau: My Life in Hockey, 92. 10 Todd Denault, Jacques Plante: The Man Who Changed the Face of Hockey (Toronto, Ontario: McClelland & Stewart, 2009): 157. 11 Todd Denault, Jacques Plante: The Man Who Changed the Face of Hockey, 159. 13 Les Perreaux, “Riots Erupt After “Rocket” Richard Suspension, Globe and Mail, March 16, 2015. McGill University Library. 14 David Shoalts, “Quebec Unrest Over in Richard,” Globe and Mail, March 17, 2005. McGill University Library. 16 Sidney Katz, “The Strange Forces Behind The Richard Hockey Riot,” Macleans’, March 17, 1955. McGill University Library. 17 Hugh Bingham Myers, The Quebec Revolution (Quebec: Harpell’s Press, 1964), 3. 18 Alain G. Gagnon and Mary Beth Moncalm, Quebec: Beyond the Quiet Revolution (Ontario: Nelson Canada,1990), 23. 19 Hugh Bingham Myers, The Quebec Revolution, 5. 20 Alain G. Gagnon and Mary Beth Moncalm, Quebec: Beyond the Quiet Revolution, 197. 21 Philip Authier, “The year ahead in Quebec politics: Brace for what could be a historic general election in 2018,” Montreal Gazette, Jan. 1, 2018. Accessed February 27,2018. http://montrealgazette.com/news/quebec/the-year-ahead-in-quebec-politics-brace-for-what-could-be-a-historic-general-election-in-2018. Published by jeffreyrowe on March 3, 2018 at 2:09 am under Uncategorized. 0 comments.